Miss Bala is an over blown drama that is laughable at times. Bala can be defines as child in Hindi or a species of shark. It appears that director Dunnet-Alcocer (first time full length, film director) sees Gina Rodriguez’s Bala as a woman who can and does become shark like when pushed too far. The story line is filled with coincidences that bring Gloria (aka Miss Bala) into situations that are filled with cliff hangers that she must slip out of to survive. It begins when Gloria and her friend Suzu (Christian Rodio) decide to attend a late night party at which a major drug gang stages a significant hit that leaves numerous bodies on the floor and girlfriend Suzu gone. When Gloria informs a police officer that she has observed the hit she is captured by the gang due to Mexican cop’s relationship with the cartel. From there, she escapes a number of gang fire fights, one in which she assists by blowing up a building. She is also betrayed by the FBI when they capture her from the cartel. Her role in the cartel changes from time to time but her determination to locate Suzu who has a young son never dwindles. The drama that occurs is very often clumsy, to say the least. Scenes are dragged out even when the outcome is obvious. The attempt at tension often becomes irritating and we feel we are watching an amateurish first act. Rodriguez’s role is also not clear, at times there is an effort to make her glamorous, she ends up in the Miss Baja contest, fixed for her to win. At other times she is tough and strong even when emotionally stretched to her limit. We are not sure who Gloria truly is. 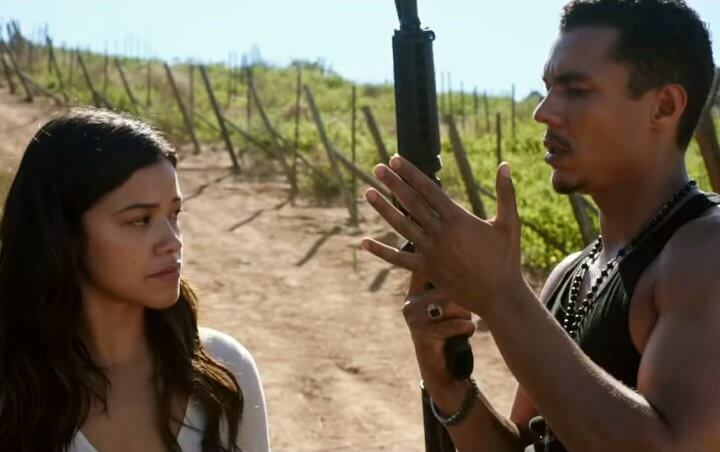 Miss Bala is not a polished thriller, and it is what it is, a remake of a Mexican film with little enhancement. MPAA Rating: Rated PG-13 for sequences of gun violence, sexual and drug content, thematic material, and language.